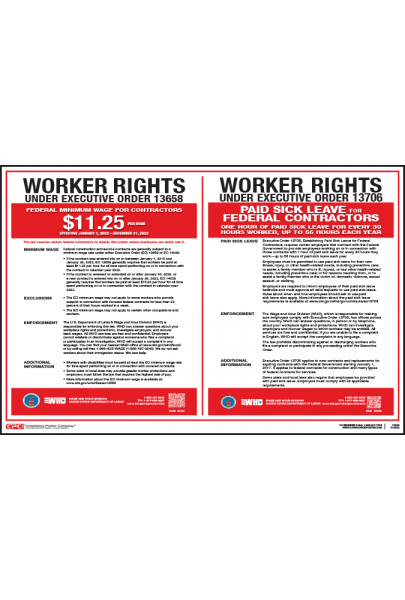 The Federal Contractor Worker Rights Poster consolidates the Federal Minimum Wage for Contractors and Paid Sick Leave for Federal Contractors notices onto one conveniently-sized poster. Contractors covered by EO 13658 and EO 13706 are required to notify employees of their rights under these Executive Orders, and in some cases to post a notice covering these rights. 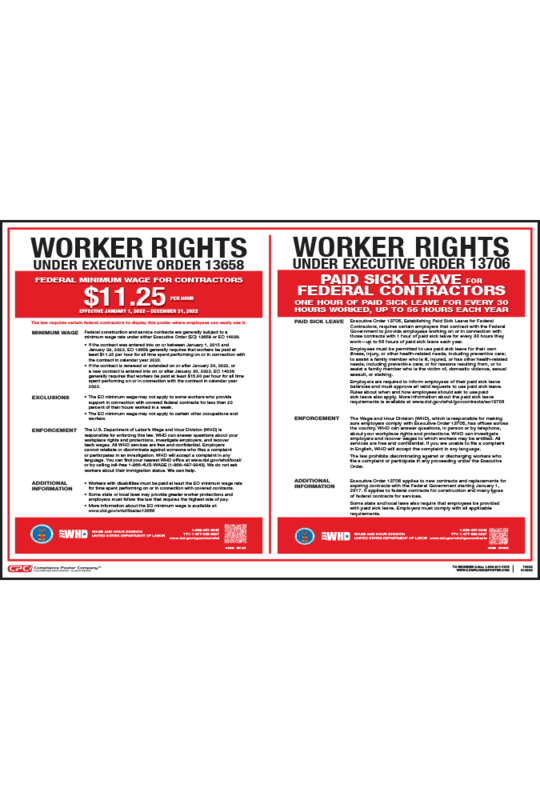 The Federal Contractor Worker Rights Poster simplifies the process by combining these two notices onto one conveniently-sized poster. Worker Rights Under Executive Order 13658 (Federal Minimum Wage for Contractors) displays the current minimum wage rate and provides a summary of the establishment of the federal minimum wage for contractors, the tipped worker rate, enforcement, and other important information. contracts to provide services in Federal buildings such as child care or dry cleaning. With respect to workers performing work on or in connection with a covered contract whose wages are governed by the FLSA, the contractor must post a notice provided by the Department of Labor in a prominent and accessible place at the worksite so it may be readily seen by workers. Worker Rights Under Executive Order 13706 (Paid Sick Leave for Federal Contractors) describes the amount of paid sick leave which must be offered and provides information on the establishment of paid sick leave for federal contractors, enforcement, applicability, and interaction with state and local law. contracts connected with Federal property or land related to offering services for Federal employees, their dependents, or the general public. The contractor must notify all employees performing work on or in connection with a covered contract of the paid sick leave requirements by posting a notice provided by the Department of Labor in a prominent and accessible place at the worksite so it may be readily seen by employees.